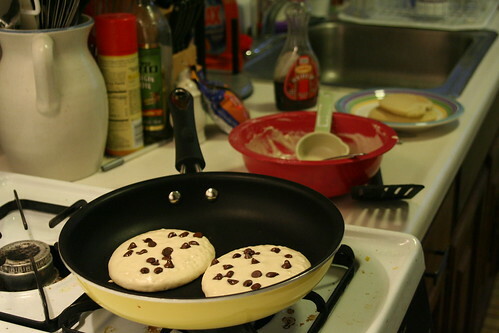 I haven't had pancakes in a really long time. I think the last time I had them was when I made these oats and honey pancakes. I had been eating a lot of savory dinners lately and I was craving something sweet. My oats are expired (oops) so I didn't want to make the oats and honey recipe, so I just went for a basic pancake. Mix all of the ingredients and drop by the 1/4 cup onto skillet over medium or medium/high heat. I use a non-stick pan and do not grease it. The flavor was all brown rice flour, too much for me, next time I would make a flour mix of some kind to give these a better flavor. This time, to make them delicious I dropped a few Tropical Source gluten and dairy free chocolate chips on them. That was the perfect addition. brown rice flour is the best for gluten free pancakes! i'm a fan of mixing it with millet and corn as well. but brown rice makes them fluffy and a tinge sweet. Yum.